A lot of men are struggling with how to be a good husband or a good father. 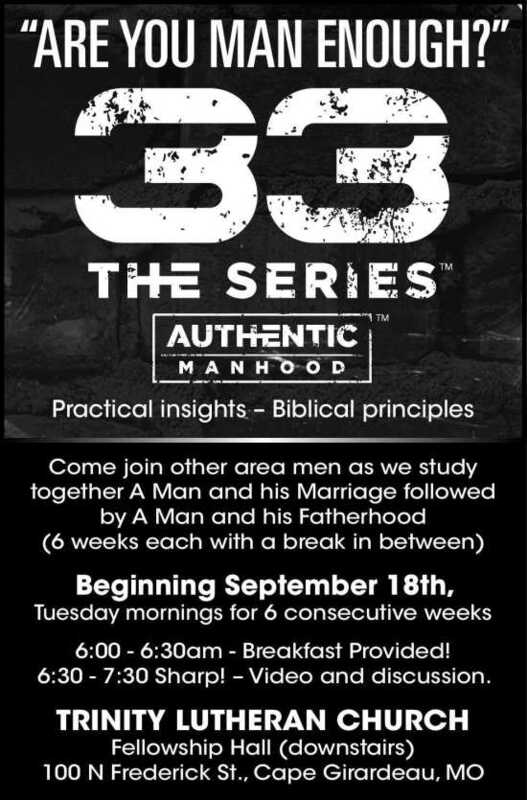 These sessions will provide men with a compass to which God designed men to be and His design for you to be a man. This material will impact men to learn what Biblical manhood is, the way God designed men to be. Through each session men will learn material to which they can take back to their homes and apply to be better husbands and fathers. This is for men of all ages, men who are not even married, but want to learn more about it before getting married. Fathers, grandfathers, and men without children. This material applies to men of all ages and backgrounds. We will cover “A Man and his Marriage” September 18th and go 6 weeks before taking a week off and then starting back up to study “A Man and his Fatherhood” before finishing for the Christmas holiday. This is not your typical Bible study and you do not need to be a Biblical scholar to join. Breakfast will be served at 6 a.m. with the video and discussion beginning at 6:30. We will end at 7:30 SHARP to be sensitive to those heading off to work.